Do You Need Another Reason To Like Zac Brown? It appears that Zac Brown Band & TikiTender have something in common. We both support Soles4Souls! (Check the link on the front page of tikitender.com. Soles4Souls is a Nashville-based charity that collects shoes from the warehouses of footwear companies and the closets of people like you. The charity distributes these shoes to people in need, regardless of race, religion, class, or any other criteria. Since 2005, Soles4Souls has given away over 14 million pairs of new and gently worn shoes (currently donating one pair every 7 seconds.) The shoes have been distributed to people in over 127 countries, including Kenya, Thailand, Nepal and the United States. ZBB and Gander Mountain have partnered to create the Southern Ground store. As a special bonus, purchase the hat you see above and 7 pairs of shoes will be donated to Soles4Souls. Big ups to Gander Mountain and Zac Brown Band! My work schedule is a little different this week. Not my favorite schedule, but I can't complain. 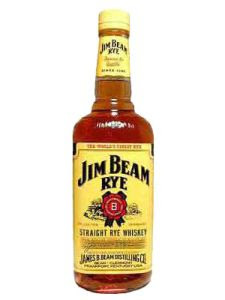 This week's whiskey is Jim Beam® Rye. Drier and spicier than its sweet Bourbon cousins, Rye adds character and depth to any whiskey cocktail. Pairs especially well with fruit flavors. This whiskey is clean and spicy, with a peppery taste and a slight sweetness. While I enjoy this whiskey on its own, it also makes a great Manhattan! Chill a cocktail (martini) glass with ice. In a mixing glass half filled with ice add whiskey, vermouth, and a dash of bitters. Stir until well-chilled. Dump the ice from the prepared glass and strain in the contents of the mixing glass. Drop a cherry in for garnish and enjoy!